There is nothing to find at the posted coordinates. Please follow the instructions below to find the cache. But first a word of warning: this cache is only suitable for well-prepared adventurers with caving experience; otherwise you could get into serious difficulty. This is a challenging and potentially hazardous geocache, requiring preparation, equipment, physical fitness, and courage. You attempt this adventure entirely at your own risk. If you have doubts at any time, please turn back; just don’t leave it too late to turn! Why is this challenge so difficult? Well, firstly you have to reach GZ of GC2JPKZ Lasciate ogne speranza, voi ch'intrate. Lasciate is a difficult challenge in itself and should not be undertaken lightly. However, I have a confession to make: when creating Lasciate, I led adventurers to believe that it would lead them all the way to the deepest cerchi dell'inferno; whereas, in fact, it stops a little short! 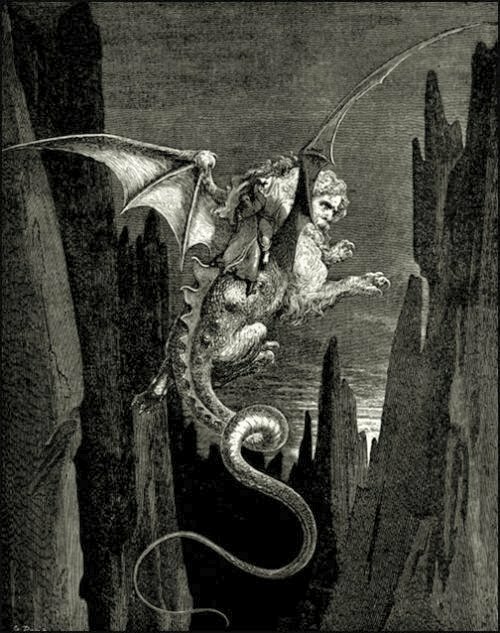 During the allegorical journey of Dan T. and his guide, the final two circles were reached only by descending into the abyss of Malebolge on the back of Geryon, a winged beast with the face of a man, the paws of a lion, the body of a wyvern, and a poisonous sting at the tip of its snake-like tail. This stage of Dan T.'s epic quest is where your own journey begins towards il nono cerchio! You have to continue beyond the final stage of Lasciate, through a narrow fissure and down into the abyss, following the instructions encoded above. Geryon may not heed your call this time, so probably a rope and/or caving ladder may be in order. An eventful and challenging adventure is guaranteed! This cache is deep within a challenging cave. Since it has to be combined with GC2JPKZ Lasciate ogne speranza, voi ch'intrate, it is a long, tough, physical trial that requires some caving experience and equipment; therefore, realistically I am not expecting many adventurers to step forward. The final prize is a simple micro, hidden in the same manner as Lasciate's cache. It contains a log only, so you will need to bring your own writing implement, and there is no room for trades or trackables – I did not wish to encourage finders to carry extraneous baggage with them, or trackables that may be lost forever! The log contains a PASSWORD, which you will need to log your find, as I may not be able to pop back too regularly to verify the signatures! You should not attempt this cache alone; furthermore, general experience from Lasciate suggests that small groups, where team members can help each other out, are most successful and have most fun. You should let a support contact know where you are going and how long you are going to be. Your support contact should be familiar with how to get in touch with Cave Rescue (999), if you exceed your time, and should know the coordinates of the cave entrance, the size of your group, where you are parking etc. It is very difficult to estimate a time limit appropriate to all adventurers, as it will depend on team size and caving/climbing ability. When setting the cache, our team of two made the round trip in approximately 2.5 hours, but it would take longer with a larger group. Please be responsible and look after yourselves. Knee and elbow pads may reduce bruising the next day! If you can pack all this into a very small space, I would try to avoid carrying anything but the smallest of packs. Bats: remember that it is illegal to intentionally or recklessly disturb a roosting bat, so please avoid all interaction, including lights and cameras, should you see one. Spiders: warning, there be some bigguns down there! Huge thanks to Mr D who was my caving buddy on the trip to set the cache. Since he didn't know what I had planned until we reached GZ, I don't see why he shouldn't be able to log a find when he next descends these depths! Amberel kindly custom-made one of his Top Cache geocoins for this cache. It is a silver coin called Uno dei Trenta and is trackable on its geocaching.com webpage. I have chosen to hide it as a RESIDENTIAL geocoin near to the cache itself. The coin's webpage gives all the details; please read them carefully else you may not find the geocoin! I hope that you will discover it, if you like to see coins and collect icons (as I do).